May 13, 2011 - Turning 40 has never been this much fun! Southwest Airlines takes its Anniversary party to the world's largest gathering of aviation enthusiasts in Oshkosh, Wisconsin, this July. More than a half-million people are expected at this year's weeklong celebration of all-things aviation in Central Wisconsin, and Southwest's special participation will include a recognition and honor of military veterans, educational opportunities for young aviators. The event will include a chance to view a Southwest aircraft as few have seen one, and will build to a "Super Saturday" presented by Southwest Airlines, featuring a nighttime airshow, fireworks, and concert. 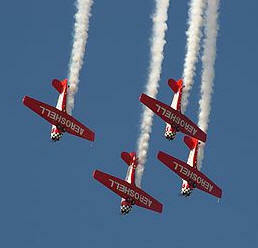 EAA AirVenture Oshkosh is The World's Greatest Aviation Celebration and EAA's yearly membership convention. From sunrise to well past sunset, "Super Saturday," presented by Southwest Airlines will be filled with must-see features, attractions, and activities, including country star Aaron Tippin in concert, a Night Air Show, and Daher-Socata Fireworks. The celebration will wrap up with a post-event party on ConocoPhillips Plaza, which will feature food, beverages, and a meet-and-greet with Night Air Show performers. "We're coming back to Oshkosh this year to share in the celebration of a milestone in Southwest history with our Employees and our Customers," said Chuck Magill, Southwest's Vice President of Flight Operations. "To have this opportunity to honor and proudly showcase our Veterans as we commemorate 100 years of naval aviation is especially rewarding and exciting." As the official airline of the Honor Flight Network, Southwest Airlines supports flights all across the country during the year, which allows Veterans to visit the WWII Memorial in Washington, D.C. One of those trips this year will transport Wisconsin veterans from Wittman Regional Airport on the Centennial of Naval Aviation. The Veterans will return to a heroes' welcome at Oshkosh during a special airshow. "Warmth, friendliness, and individual pride are not only synonymous with the People of Southwest Airlines, they also can be used to describe the spirit that exists all throughout AirVenture and the EAA community," said Tom Poberezny, EAA and AirVenture chairman. "We are thrilled to have the support of Southwest as presenting sponsor of 'Super Saturday,' adding another exciting element to one of the many 'must-see days' at AirVenture." The 59th annual edition of "The World's Greatest Aviation Celebration" will be held July 25-31 at Wittman Regional Airport in Oshkosh. Additionally, Southwest is sponsoring a sweepstakes to provide one winner with roundtrip air travel to Milwaukee for two, one-day's admission to AirVenture for two, and a two-night hotel stay. Visit NUTS About Southwest, the carrier's Company blog, to read details about this year's partnership as well as a recap of Southwest's past involvement with EAA AirVenture Oshkosh. Southwest Airlines serves Milwaukee Mitchell International Airport with nonstop flights to six cities: Phoenix, Las Vegas, Kansas City, Baltimore/Washington, Tampa Bay, and Orlando. Additional one-stop or connecting service links Southwest Customers in Southeast Wisconsin to 55 cities across the country.